Creative desk is a great way to add excitement to study and playing and reinforce learning at the same time. Sit and stand proved to be the most ergonomic way to keep children focus while keep them healthy. * The kid's desk is adjustable as the kids grow, Suitable Height from 3.6" to 5.9", Age from 6-18 years old. * Ergonomically designed and height adjustable from 20-27.5" to avoid unhealthy slouching. * Titable desktop provides better angel for writing, reading and drawing. * More additional function,Reading Stand,Hanger for bags,Adjustable Feet,Round Edge,etc. * Pink and Blue optional for boys or Girls. 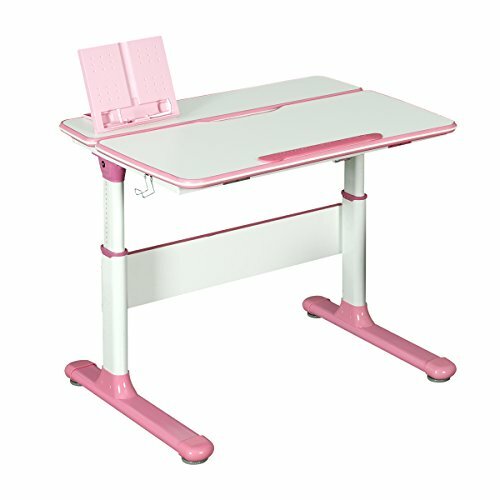 The kid's desk is adjustable as the kids grow, Suitable Height from 3.6 ft to 5.9 ft, Age from 6-18 years old. Ergonomically designed and height adjustable from 20-27.5" to avoid unhealthy slouching. Titable desktop provides better angel for writing, reading and drawing. More additional function,Reading Stand,Hanger for bags,Adjustable Feet,Round Edge,etc. Pink and Blue optional for boys or Girls. If you have any questions about this product by WLIVE, contact us by completing and submitting the form below. If you are looking for a specif part number, please include it with your message.